This Schaum Torte is a simple, but elegant dessert and is absolutely phenomenal! 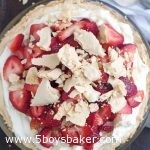 A meringue shell filled with sweetened whipped cream and piled high with strawberries. . . you will be in love! Today’s recipe is one I’m bringing back that has been buried deep in my archives gathering dust and in desperate need of photo updates. This Schaum Torte is a recipe I got from my mother-in-law years and years ago. I’ll never forget the first time she made it. One bite and I was so completely in love with it. Yes, desserts have been known to make me fall head over heels in love with them. What about you? I had never before in my life tasted a meringue shell. . . .Um, hello deliciousness! I remember thinking “where have you been all my life?” This is such a simple dessert. I always make my shells the night before and then fill them with the whipped cream and strawberries a couple hours before serving. This dessert really is best if eaten the day you make it, but when we have had some leftover, it still gets devoured, even if the shell has gotten a little gooey. Such a refreshing, simple and delicious summer dessert. 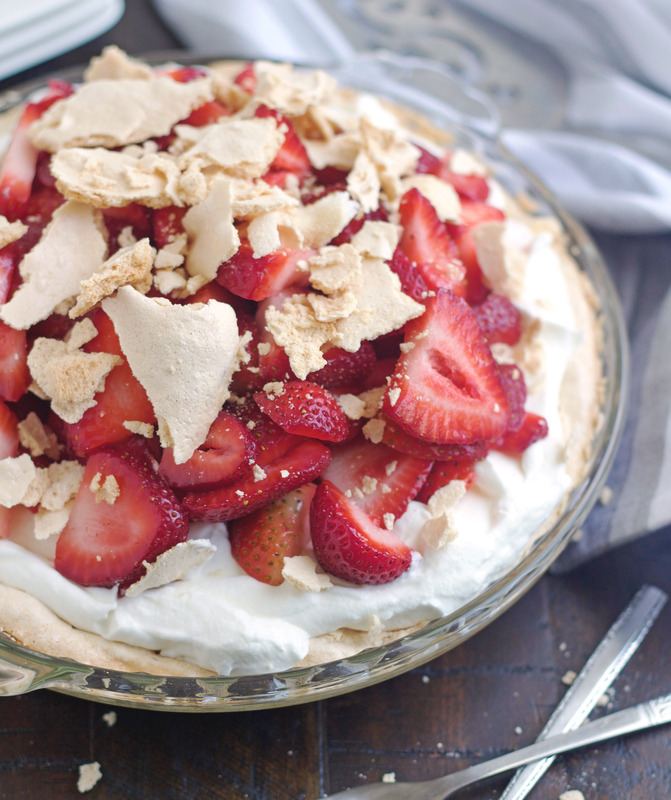 You can also use peaches or raspberries, or a combination of berries, but our favorite is with just strawberries. Promise me you will make this. In the bowl of an electric mixer, using whisk attachment, beat egg whites, vinegar and cream of tarter until very stiff. With mixer going, slowly add 2 cups of sugar and continue beating until glossy, soft peaks form. Divide into two 9-inch buttered pie plates. Bake at 300 degrees for 20 minutes and the reduce heat to 250 degrees and cook for 40 more minutes or until shells turn a light, golden color. Turn oven off and allow meringue shells to cool several hours in the oven. Beat whipping cream and add sugar and vanilla to taste. Break off top pieces of meringue shell, if desired then fill the shells with the whipped cream between both shells and spread evenly. Top with lots and lots of fresh strawberries. As the shells bake, they usually puff up a little bit. 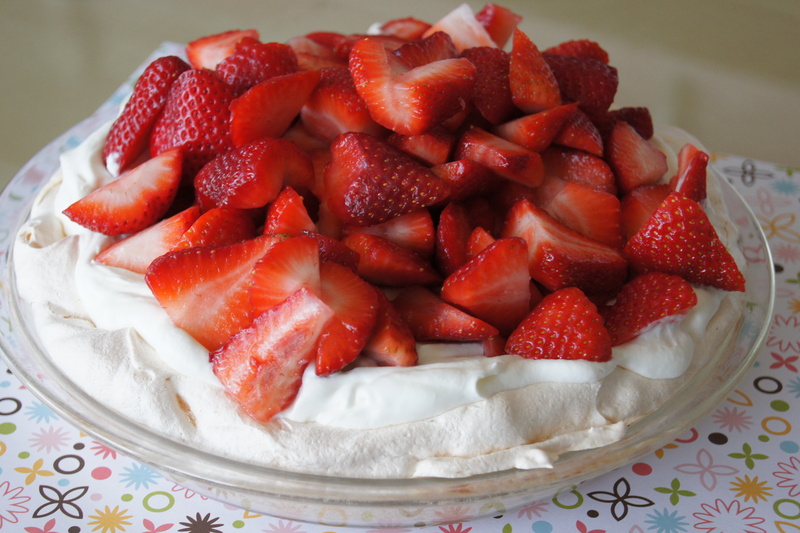 You can break off pieces from the top and then fill the shell with the whipped cream, top with strawberries and then place the meringue pieces on top. If the shells didn't raise enough to break off pieces, you can certainly just pile the whip cream in the pie plate without breaking off meringue pieces. I did cook my shell a little longer than normal so it's a little darker than usual. So if yours isn't this color after baking it, don't panic. If you like a crispier shell, you certainly can cook it a bit longer until it gets this color. I like it either way. Originally posted July 12, 2012. 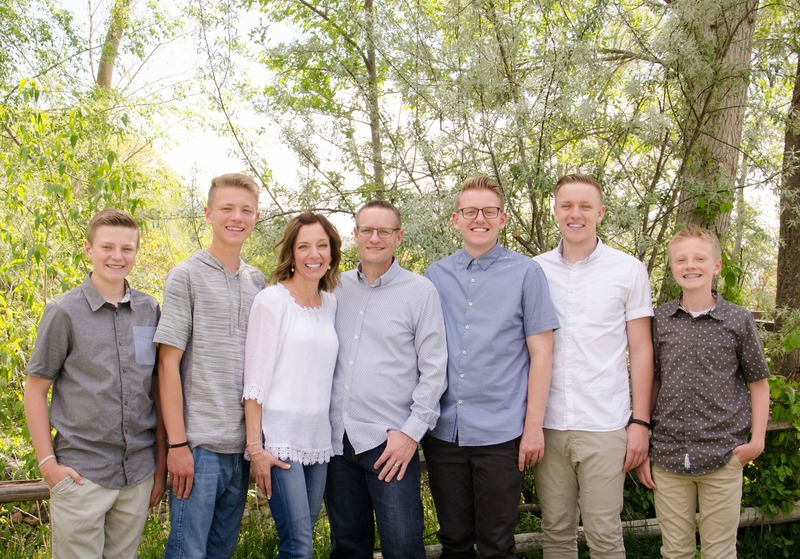 Updated with new pictures and commentary. I am lucky enough to be the recipient of many of Jodi’s desserts….I can honestly say this is one of my favorites. Hi Karin! I’m so happy you found my site. I would love to hear from you anytime you try something (and hopefully you’ll always love it!). This torte is honestly divine! It’s so simple and is unbelievably good. I look forward to hearing from you more. If you have any fabulous recipes you think I need to make, I would love to try them out. Take care. 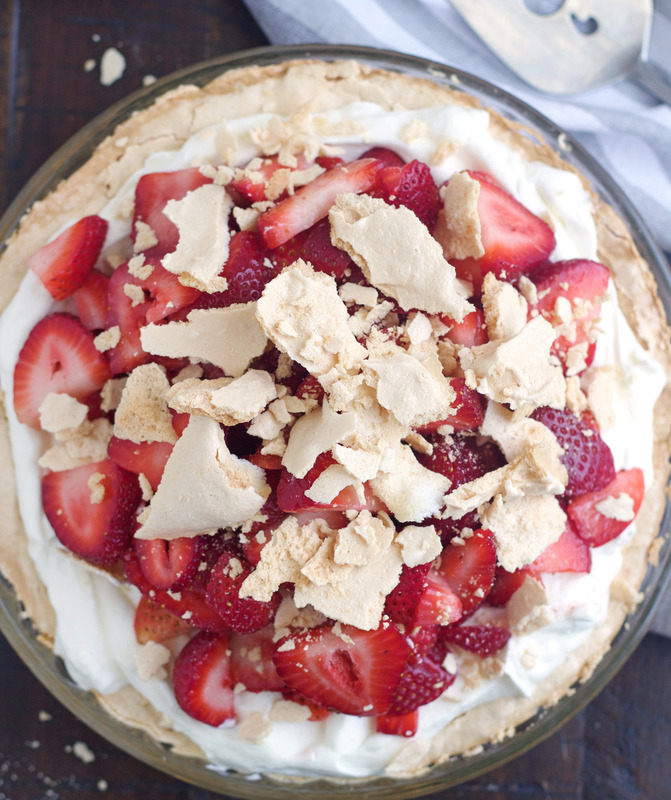 This is not only beautiful but it sounds like the ULTIMATE summer dessert. Mmm, this looks wonderful. An Italian frozen yogurt place that I used to go to sold soft-serve topped with broken meringue bits, fresh fruit, and pistachio syrup. Your dessert reminds me of this- I bet swapping in froyo for the cream would be excellent as well! Thanks Allision! That sounds delicious! WOAH this is so elegant and simple! I feel like I need this in my back pocket for when friends want me to make a dessert the same day and I never know what to do!